Pakistan has the highest number of children that die during child birth or on the first day of life. Unfortunately, it is the top country in the world that’s been unable to meet security requirements for newborn babies, yet there is no official notice of this. According to the latest Save the Children report “Ending Newborn Deaths: Ensuring every baby survives” Pakistan has the highest rate of first day deaths and stillbirths at 40.7 per 1,000 births, followed by Nigeria (32.7), Sierra Leone (30.8), Somalia (29.7), Guinea-Bissau (29.4) and Afghanistan (29.0). The root cause of this is the lack of skilled health workers with the right equipment and medical supplies to support mothers, especially in the most rural and remote areas where they are needed the most. Coverage of skilled midwives is nearly five times higher in the wealthier women compared with the poorest. Which implies that equity in reducing disparities should looked into more seriously and systematically. It is now apparent that Pakistan is not on track to achieve Millennium Development Goal (MDG) 4, which is focused on achieving two third reduction in under 5 mortality. As per the findings of the latest Pakistan Demographic and Health Survey 2012-13 the under-5 mortality rate is 89 deaths per 1,000 live births. 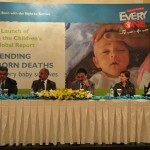 This means that one in every 11 children born in Pakistan during the period died before reaching their fifth birthday. The infant mortality rate estimated in the survey is 74 deaths per 1,000 live births meaning that one in every 14 children born died before reaching their first birthday. The neonatal deaths rate is 55 per 1,000 live births and is stagnant. The key causes for ‘high first-day death rates include high numbers of preterm births and low birth weight babies (in Pakistan 32% babies have low birth weight according to the National Nutrition Survey 2011), poor maternal health and nutrition, girls and young women having children at a young age, low contraception use, lack of healthcare for mothers and skilled care during birth. According to the report, the number of intrapartum stillbirths and first day deaths could be halved with trained midwives and free healthcare facilities for mothers and babies. There is a critical need to prioritise saving the lives of mothers and their newborns like rest of the world and take effective steps. Reduction in the number of women who die in childbirth means millions of children who get to grow up with their own mothers and getting a chance at life. The report highlights some social determinants affecting newborn mortality which need to be changed. Maternal nutrition; malnourished mothers have less healthy babies. Reproductive health and rights; mothers who are under 20 are 50% more likely to have a stillbirth or a newborn death than older women. Children born less than two years after a sibling are two times more likely to die within the first year of life than those born after three or more years. There are many changes to reduce newborn mortality that need to be made outside the clinical setting, such as empowering communities to remove barriers to healthy behaviours, demand healthcare, engage men and fathers, support breastfeeding and hygiene. Before considering healthcare around the time of birth, there is a need to evaluate many health services outside the period of labour, delivery and immediately afterwards. Family planning services, antenatal checks, follow-up care with the newborn are essential parts of reducing stillbirths during labour and newborn mortality. I was quite encouraged the other day while having a discussion on the subject at a live radio show when many concerned men called from areas like DI Khan, Lakki Marwat, Zobe, Upper Dir and Swat highlighting various challenges faced including the lack of access to health facilities, absenteeism of health workers from health facilities in far-flung areas, lack of focus on women in certain projects in southern districts of Khyber Pakhtunkhwa, lack of awareness about family planning, poor nutrition for women during pregnancy and poverty etc. As discussed above it is critical to empower communities in order to remove barriers to healthy behaviours and that they start demanding healthcare. When I asked them if they took any action to respond to health workers absenteeism? They were quite. We need to change this. This situation requires immediate action on part of the federal and provincial governments, development partners, civil society, professionals, NGOs and media. The federal and provincial governments should come up with detailed Action Plans with required budgetary allocation as plan without budgetary allocations have little success in being implemented. This issue requires extensive campaign to raise awareness and advocacy, in which media can play a key role. There is a need to reach out to people in the far-flung areas and create awareness about issues like birth spacing, importance of the first 1000 days of a child (from conception to second birthday), and finally access to trained health workers before, during and after delivery. While conducting the survey, it was found that the patients are not satisfied with the behavior of the doctors, females specifically complained about the rudeness of the family planning staff. Health workers should be guided and emphasized on keep a good attitude and behavior. They should help the patients understand their dieses and pain, as this helps reduce the trauma they are going through. This is a very informative article, especially about FP&RH, I totally agree that there must be awareness workshops to highlight these issues. The Federal and Provincial governments should come up with detailed action plans with required budgetary allocations as without this there is little chance of successful implementation. It is a shame to see our country be recognized in such poor surveys. I could not agree with the author more on “it is critical to empower communities in order to remove barriers to healthy behaviours and that they start demanding healthcare.” Many people, especially women don’t know what should be entitled to. It is therefore important to raise this awareness.